Nutrition will not prevent disease, but good nutrition lowers disease risk. A direct association exists between diet and dental disease in rabbits. Hay: 75-80% of diet. Provides fiber, calories, stimulates gut motility, and controls cecal fermentation. Hay is absolutely critical to maintaining healthy teeth and gut. High Fiber Pellet: 20% of diet. Provides calories, protein, vitamins, minerals, and essential fatty acids. Pellets should be limited. It is easy to overfeed if not measured. Pellets lack the benefits of hay and veggies and should not be fed in isolation. Green Veggies: 5-15% of diet. Greens provide vitamins, minerals, and water. Consult recommended lists for approved veggies. A diversity of nutrient sources is desired. Water: Fresh, clean water should be available at all times. Cecals: – Your bunny’s own cecals provide essential amino acids and are a vital energy source. If your rabbit has a problem producing cecals please consult a rabbit savvy vet. Treats: 0-5% of diet. Avoid sugary treats and overfeeding of treats. Too many treats discourage the consumption of healthier foods. A diet high in sugars causes an overgrowth of harmful bacteria resulting in painful gas or GI Stasis. Do Not Feed: Yogurt Drops, popcorn, bread, crackers, nuts, seeds, or dried fruit with added sugar. Most healthy, adult companion rabbits benefit from cutting back on high calorie foods. Offer restricted (measured), low-calorie pellets. Substitute veggies for sugary treats. Increase hay intake and varieties of hays offered. 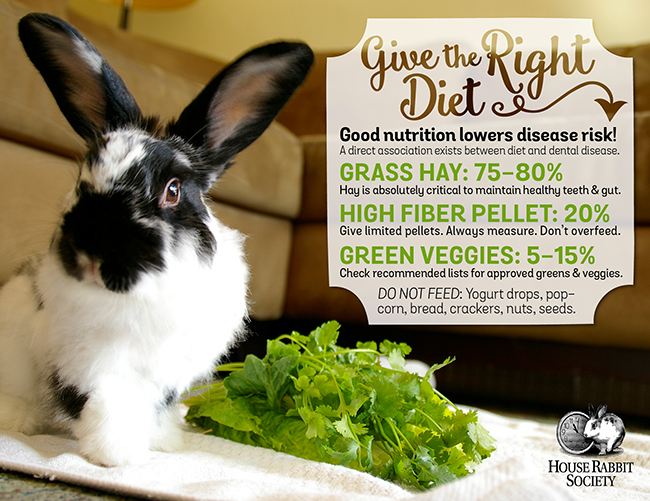 Rabbits are designed to ingest large amounts of high fibers foods, such as hays. Nutrient requirements change over the life cycle. Pregnancy, lactation, extreme weight loss, old age, illness, or obesity all change nutritional needs. Nutrient need varies with body size. Specific breeds such as Angoras (and other long haired breeds), Rexes, and Giant breeds all have distinct nutrient needs. Dr. Susan Smith, Ph.D., Professor of Nutritional Sciences, University of Wisconsin-Madison.